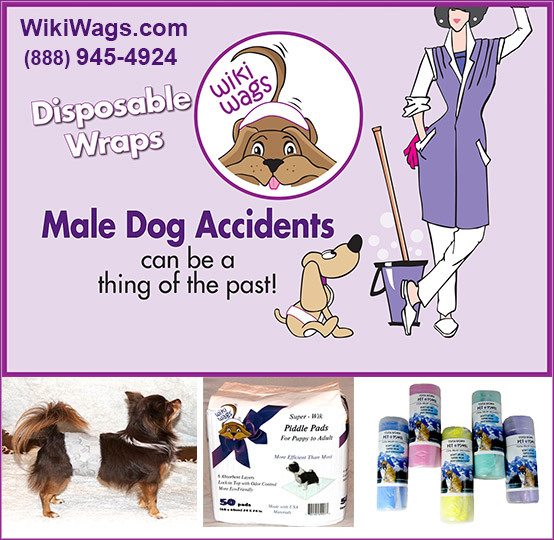 Wiki Wags Disposables for male dogs puts you back in control. Affordable, comfortable, highly absorbent, stops "male marking" in it's tracks! How Did Wiki Wags Come To Be? Wiki Wags Disposables started with a simple premise: Make available to every pet owner the resources needed to live a healthy, active, and enjoyable long life with your pet. At the same time, educating pet lovers about the importance of healthy training and the alternative choices available in the male dog belly band when all else fails. This same idea that drives us today is the same philosophy experienced by many happy customers who use Wiki Wags products. The track record we've accumulated over the years speaks to our commitment to the support we offer for our pets, their families, and the community at large who need doggie diapers. How Long Should I Leave My Wiki Wags On? When using the Wiki Wags brand Disposable Wraps we are often asked how long should we leave it on and my answer to them is simple! Use common sense just like changing a baby's diaper. Each dog's habits are different and so are the times they have to go however, we have found that many times they can "go" several times before they need changing. Are Wiki Wags Easy To Put On My Dog? Yes! Just watch our video below! Can I Leave My Wiki Wags On All Day When I am Gone To Work? Wiki Wags products out perform most all other products on today's market and have a fantastic absorbency rating - each size has an increase in their wicking ability so the larger the size, the higher the absorbency factor. Many of our customers have dogs that wear them 24/7 but change them as needed. It is also not recommend leaving the same wrap on your dog all day long without changing. The urine is absorbed in the diaper and could become very heavy over time. Can I Re-Apply After I Take My Dog Outside to Use The Bathroom? One of the beautiful features of these Disposable Male Wraps is the convenience of being able to take them off and then re-applying them after letting your dog outside or going for a walk. Some people prefer to use them only while training and others use them when training has failed or age has created those senior problems. Regardless of the reason, they are all about convenience! They are healthier for your dog than cloth wraps and do not cause rashes or urine irritation. What About Wiki Wags For Female Dogs? The Wiki Wags company is currently working on adding their female line of diapers sometime in 2015 as numerous pet owner's are encouraged and eager to find a diaper that will stay on the dogs better. ..with a super undeniably unique wicking power! Unbelievably nice, super wicking floor pads are certainly top of the line. Suitable for dogs from puppies to adult. These actually aid in those ever so nasty times that more urine lands on the floor under the pad than on top...they actually wick the urine onto the pad. Also, a real bargain in the amount of pads you will save when you compare them to the cheaper brands because they are so much more absorbent! What Sets SUPER-WIKS Piddle Pads Apart From Competitors? When comparing the Wiki Wags brand of "Super-Wik" Piddle pads, it's easy to notice the difference! They may look like other brands but don't let that fool you! They too, are made for "super" wetness with 6 extremely Absorbent Layers, a lock-in top layer for odor control, un-scented for safer living, and are made with USA materials. When you pick up a pack of Super-Wik Piddle Pads to take home, you can feel the difference in the weight of the 50ct bag. That's all the extra quality in a 24" X 24" pad. You'll find less mess on the floor and more on the pad due to their wicking ability. Did we mention, they are sufficient for puppies through adult dogs ? What Do People SAY About Their Wiki Wags? Thank you. Once in a while, something small comes along that has a profound effect. Our Brussels Griffon is 15 1/2 and needs to "go" much more often. I vowed I would never put a diaper on him, so I invested a good deal of money in carpet cleaning products and frequent visits from the carpet cleaning companies.. Then, my local pet store introduced me to these Wiki Wags. THANK YOU!!! ! They are soooo easy to use and my Brussels Griffon does not mind them at all!! They are NOT cumbersome. They are simple to use, effective and truly an EXCELLENT product. Thank you for whatever time, money, etc., you put into developing these Wiki Wags. They are perfect for my Brussells (Brussels) Griffon. I find myself wondering why I didn't do this sooner. He is happy and we are happy and grateful! Thank you so much Linda for all your help today. Wiki Wags is a wonderful product and I am so glad my sister found them for me about 8 months ago. They are GREAT!!!! Order Your Wiki Wags or SUPER-WIK Piddle Pads Today! All of our products are affordable, address today's lifestyles, and bring harmony back in the home! Just as important, our dedication and commitment are second to none. We think you'll notice the difference immediately when you first place our wraps on your male dog. With comfort and ease, you will see the difference from anything else you've tried. We'd love to hear from you today and tell us your story because at the Wiki Wags company...we listen! Also available at JeffersPet.com and DrsFosterandSmith.com and several great locations!